In 1996, heavy smog clouded Chile’s capital city Santiago. The air quality was so poor that influenza spread violently throughout the city, sending approximately 3,500 children to the hospital daily. Three years later, the capital’s smog concentration only continued to increase, breaking records and forcing the government to declare a city wide environmental emergency. Despite legislation to decrease air pollution, on Monday June 22, the deadly clouds of smog once again hung in Santiago’s skies, causing the Environmental Ministry to declare an environmental emergency—the first since 1999. As a result, the city partially shut down, closing more than 1,300 factories and forcing 80 percent of the 1.7 million cars in Santiago to cease operation. Approximately 6.7 million people flooded the city’s subway system, because they were unable to operate their vehicles and urged to avoid physical activity outside. Although smog is common in Chile, one of the most air polluted countries in the world, according to the Environmental Ministry, the declaration of an environmental emergency is induced by the amount of small breathable particulate matter, PM2.5, in the air. PM2.5, PM10, CO, NO2, and O3 are Chile’s main air pollutants. The growth of air pollution in Chile stems from both increased industrialization and environmental factors that continue to affect the region’s climate and are critical to the country’s health. As an industrial revolution booms in Chile, the country’s air has been flooded by toxic emissions. Urban cities face the worst of the pollution, as factories are booming and urban centers are growing. The main contributors towards the accumulation of PM2.5 are cars, buses and trucks, thermoelectric power plants, boilers, industrial processes, foundries, metallurgic processes, biomass combustion, firewood heating, agricultural burning, and ammonium emissions from agricultural processes—all a result of increased industrialization in Chile’s main cities, especially Santiago. Winters exacerbate air pollution as the continued reliance on wood-burning stoves, used to heat homes, produces large emissions of small particles into the air. In addition, constructions zones, agricultural fields, and dirt roads produce detached sediment particles that are transported to the streets in cities like Santiago. The particles dry out and are swept into the air through vehicle and wind turbulence, thus augmenting PM2.5 pollution. In addition to urban growth, Chile’s geographic location and climate contribute to the influx of air pollution. Santiago, in particular, is nested in between two mountain ranges, the Andes and the Cordillera de la Costa, creating a stale air pocket in the valley with minimal ventilation. The city’s basin landscape spans from an altitude of 450 m on the western side to over 750 m on the eastern side. The bowl-like shape of the city traps pollutants in the air and generates a stagnant cloud of smog around the city. In order for pollution to escape the valley, the city requires constant rainfall. Each time it rains, smog disperses and pollution levels decline. Rainfall also halts the amount of sediment particles added to the air by keeping the ground moist, since wet sediment cannot be picked up and circulated through the air. Unfortunately, Chile has been existing under drought conditions for approximately eight years. This past June—characteristically the peak of the rainy season—was the driest since 1968. Furthermore, weather reports do not forecast any upcoming rain. Since the start of 2015, Chile’s precipitation totals fewer than 12 millimeters, far below the normal half-year average of over 100 millimeters. In fact, rainfall levels are predicted to continually decrease. According to the Center for Global Change at Chile’s Pontificia Universidad Católica, rainfall in Chile will drop 10 percent by 2040 and at least 30 percent by the end of the century. The persisting drought also spurs forest fires throughout Chile. The lack of precipitation has dried out the ground with unusual winds from the coast to the Andes spreading fires rapidly throughout the country. In January 2014, forest fires devastated central Chile and especially Santiago. A total of 47 fires were active in the area at one time and approximately 30,000 acres of land were burned out. So far in 2015, most of the major forest fires have occurred in Southern Chile with a total of 14,800 acres scorched in the China Muerta reserve, the Nalca Lolco reserve, and the Conguillio national park. This region remains a red fire hazard zone, while the rest of Chile remains a yellow hazard zone, placing the country in grave danger of repeated forest fires. So far in the 2014-2015 term, 225,670 acres have been destroyed by forest fires, greatly surpassing the previous average of 146,533 acres per year, rendering this mass deforestation a national crisis. Forest fires have a similar effect as that of wood-burning heaters. The smoke is contaminating the air with PM2.5 particles and in areas of high hazard, citizens are encouraged to abstain from outdoor activities and hospitals have set aside 20 percent of their beds for patients with newfound respiratory problems deriving from toxic smoke. 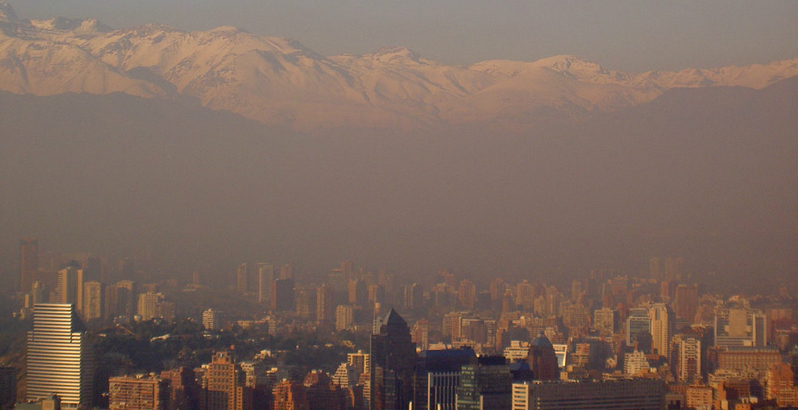 In Chile, high airborne pollution levels have been linked to both cardiovascular and respiratory diseases. Pollution can also exacerbate existing medical issues. Specifically, high levels of ingestion can cause chronic bronchitis, reduced lung function, and increased risk of heart disease. Influenza is another common ailment, which spreads rapidly through the intervention of an abundance of smog. Areas with increased levels of particulate matter, NO2, and CO tend to have higher hospitalizations for cardiovascular issues. In 2004, the Chilean city Temuco, a wood-smoke polluted city with a population totaling around 340,000, had a total of 1,587 deaths in which 24 percent were cardiovascular related and 11 percent were due to respiratory diseases. Between 2004 and 2007 in Santiago, a study concluded that out of 75,303 hospitalizations, 51.5 percent were from cardiovascular diseases. Although the risks of contracting an illness from air pollution are high for everyone, young children, pregnant women, and those over the age of 65 are most susceptible. Medical issues due to the polluted air in Chile will continue to increase if nothing is done to clean up the skies. Chile’s core environmental legislation, the 1994 Environmental Act, remains the fundamental policy on environmental sustainability. Through the Environmental Act, The National Commission for the Environment (CONAMA), an organization equivalent to the U.S. Environmental Protection Agency, was founded in the same year. CONAMA works to ensure that citizens can live in an environment free of contamination and to preserve and protect nature. It coordinates with the transport, health, education, urbanism, and agricultural ministries, as well as the community, to support better air quality. In terms of regulation, the legislature focuses on environmental quality and emission norms, process norms, and prohibitions. However, CONAMA itself does not control the actual regulations; specific ministries determine the limits on emissions. For example, the Ministry of Transport is in charge of limitations of motor vehicle emissions. The regulations are controlled through taxes, fees, emission permits, and audits and when violated, the perpetrators can be fined, sanctioned or lose their emission license. Though regulations do exist, environmental pollution persists, thus demonstrating a lack of strong initiative on the part of the government to combat a clearly lethal issue. In 2012, the Ministry of the Environment enacted new regulations on air pollution, the Primary Standard on Fine Inhalable Particulate Matter PM2.5, in hopes to create better health conditions for Chile by classifying what concentration of PM2.5 establishes dangerous living. This standard is set at a daily maximum concentration of 50 μg/m3 and an annual maximum concentration of 20 μg/m3. In addition, when daily PM2.5 concentrations are over 50 μg/m3 for 98 percent of the year, the situation is considered exceeded. Under the Primary Standard, a zone with such exceeded levels results in a declaration of environmental emergency, which is what occurred in Santiago on June 22. Despite greater efforts, Chile still needs a more definitive plan to combat air pollution in its cities. Bans have been placed on wood-burning heaters and new homes are constructed with better insulation and heating conditions to prevent polluting wood-burning practices. In Santiago, transportation has been reduced by 40 percent in order to slash toxic emissions, along with restrictions on industrial emissions and a new focus on enhancing the city’s public transportation system. Although CO2 emissions, methane emissions, ozone formation, and soot emissions have been reduced, the reduction process is slow, the air pollutions levels are still morbidly high, and climate change continues to pose an imminent threat. More research is necessary to better understand the sources of pollution and to create more effective tools to reduce air pollution levels to usher in a healthier Chile.